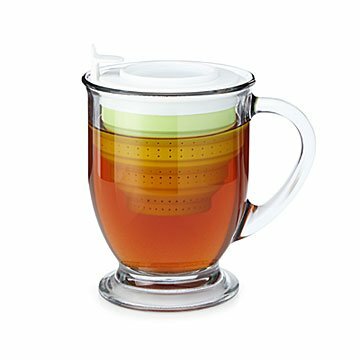 Pop open this clever design to brew tea or coffee in your favorite mug. Pop. Steep. Sip. Repeat. This cleverly designed silicone steeper pops open to brew tea or coffee right in your favorite mug. When you're done steeping, the lid doubles as a handy drip catcher to spare you those annoying stains. Pop the flexible steeper closed and, at just 1.25 inches, it will easily fit in a desk drawer, purse, or pocket. Made in China. In 2004, Maria Upenski opened a small tea shop in the heart of downtown Boulder, Colorado. Her goal: To make loose leaf tea easier to drink, and also to spread its unparalleled health benefits. “I learned about the benefits of loose leaf tea when I was getting better from cancer,” Maria says. She opened the shop to see if local residents had any interest in tea, and from there, which flavors and tea accessories they preferred. The customer feedback from those early days has influenced everything from how The Tea Spot is run, to the teas they serve, to the tea steeping products they sell. Today, The Tea Spot is a women-owned and operated certified B Corporation. They are proud to make loose leaf tea more accessible to people around the country. Use with loose teas, cover used as a drip tray as well.